For 3 years I poured my time and creativity into designing and hand stitching Red & White Explosion (66" x 66"). It was juried into Road to California 2018 and is a semi-finalist in AQS Paducah this spring. But after disaster struck I thought I would just have to throw it out. Find out what happened, and what I learned along the way that can help you. Double Dutch Delft, (56" x 56") my first two-color quilt. I love the simple elegance of traditional two color quilts. It’s such a classic look. 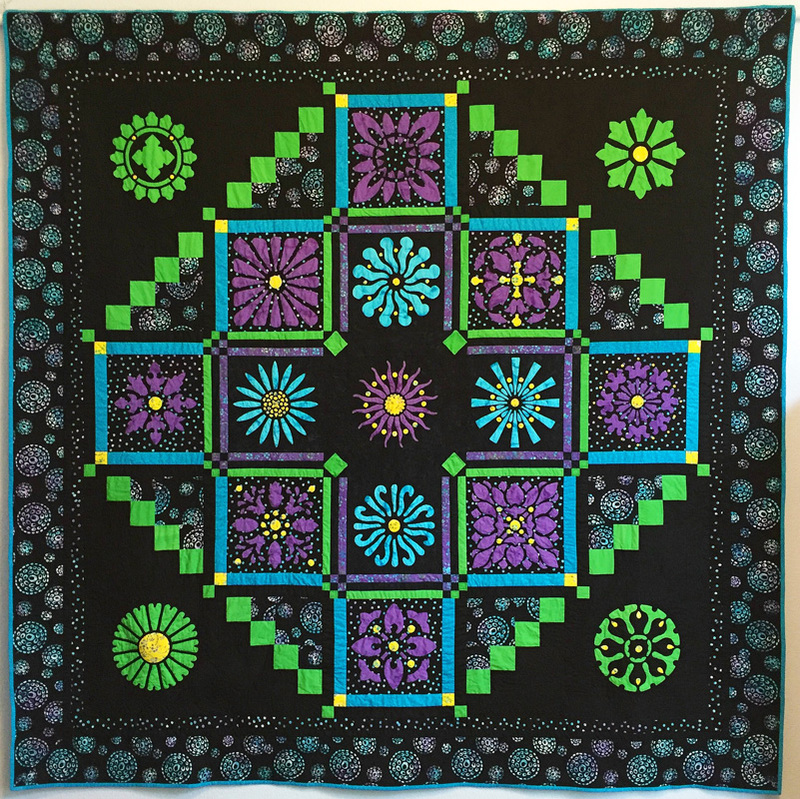 The first two-color quilt I designed and made was Double Dutch Delft(56" x 56") for Eye of the Beholder Quilt Design. I had fun playing with positive and negative space, represented by applique and reverse applique blocks respectively. I was motivated and inspired to design and make my second two-color quilt in 2014 when Houston International had a Red & White quilt competition to celebrate their 40th Anniversary, and then Vermont Quilt Festival had their own Red & White quilt competition in 2015. These competitions were all the impetus I needed to take my design ideas for a red & white quilt and make it a reality. Though I had missed the Houston deadline, I thought that perhaps I could meet Vermont Quilt Festival's deadline. After all, I already had my blocks designed and patterns ready. In late November 2014 I designed my new two-color quilt's layout. It was to have a 30” x 30” sashed and appliqued center medallion surrounded by a border of 16 different 12" x 12" reverse applique blocks. I was going to hand stitch and hand quilt it. This quilt was for me, not for the business. I hoped, some day, to enter it into quilt competitions. I’m sure you can already figure out that my idea was bigger than my time. But I was not deterred. This was not a quilt I wanted to rush through, so I simply amended my deadline. I gathered my fabrics. I pre-washed and ironed them all before putting them into my sewing room. 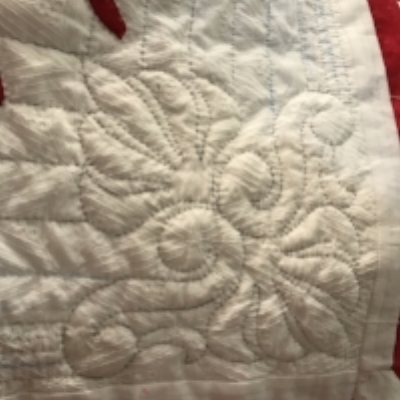 25 years before I made a Christmas quilt and my red birds bled when I washed it. I did not want a repeat experience with this quilt. 30" x 30" center medallion. to set whatever dye doesn’t washed out into the fabric. I cut out my blocks, traced the designs onto the fabric, and began to baste following my trace, baste, snip & stitch process. By January 1, 2015 I had the 30" center medallion completed. Early January 2017 my red & white quilt top was assembled and ready for layering and thread basting. Deadlines for the business started pressing in and I had to put my red & white quilt aside. Throughout the year as I designed new patterns, created quilt samples and traveled to exhibit at quilt shows, I would pick up my red & white blocks and stitch a bit more. 2015 turned into 2016. By the end of 2016 all my blocks were finished. Hooray! Many of you saw my posts on social media of the blocks’ progress and were very encouraging. Thanks for that. Midnight Explosion Quilt VII (95" x 95"). Can you find the corresponding blocks in my red & white quilt? Aside an aside, in 2016 Batik Textiles asked me to design a quilt featuring their batiks. I felt inspired by their black and brights batiks. I took many of the same block designs used in my red & white quilt, lay them out differently, and created Midnight Explosion Quilt VII (95” x 95”). This design became a pattern that premiered at Houston Market, fall 2016. Creatively, I love playing with fabric, color and design, don't you? So fun to see what happens! After Houston International was over in 2016 I revised and finalized the layout for my red & white quilt, and machine pieced my top. On January 7, 2017 the got layered, thread basted and finally into my quilting hoop. On January 7, 2017 my quilt went into the quilting hoop for hand quilting. In 2017 I was returning to Vermont Quilt Festival to vend and also to teach. As a faculty member, I was invited to hang a showcase piece. I decided my red & white quilt, now named Red & White Explosion(66" x 66"), would be my faculty showcase piece, so, I set myself a NEW completion deadline of June 21, 2017. Nothing like a deadline to get things done. Mind you, I was still designing and stitching quilt samples for new patterns for the business. But I was determined. Every chance I had I hand quilted. I created new patterns for the business. Then I hand quilted some more. And some more. It so happened that I had a forced rest in April because of having a second spinal fusion. I hand quilted, and hand quilted and hand quilted…2-6 hours a day for months, as I healed. Red & White Explosion(66" x 66") became my recovery quilt. Tracing stencil for red space in reverse applique block border. Block 13 quilted. Focus quilting in the negative space to accent the reverse applique design. Auditioning stencil idea for stripped outside border. By early June, just in time, I was ready to put the binding on. 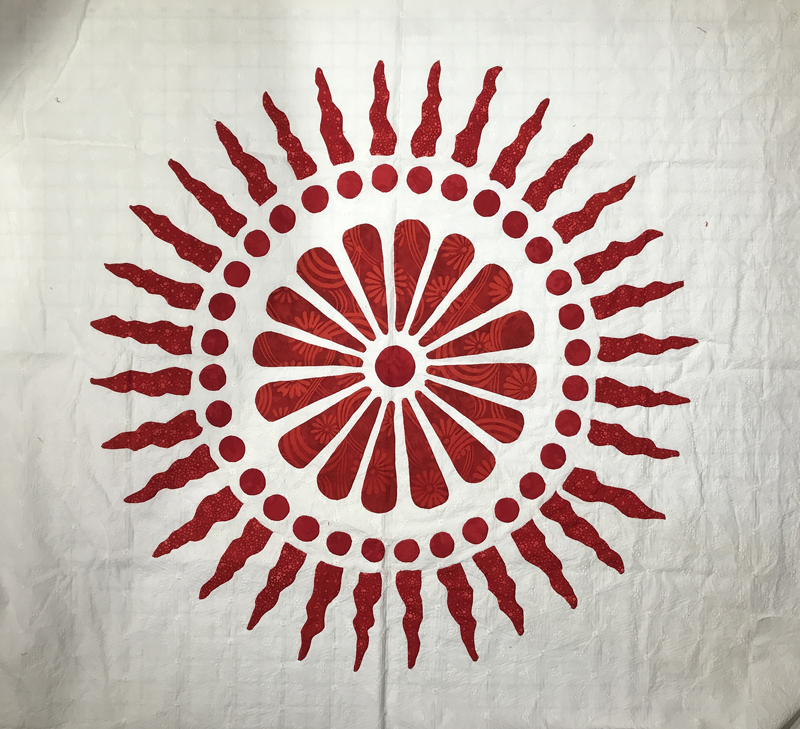 I machine stitched the binding on, packed up my Red & White Explosion quilt along with needle and thread, and I headed back out on the road to vend at Kansas City Regional Quilt Festival, June 15 – 17 and the Vermont Quilt Festival, June 23 – 25. In the evenings I hand stitched the binding on in my hotel rooms. Hooray! By June 20, 2017 and my quilt was done. I was to deliver my finished Red & White Explosion Quilt the next day, June 21 at Noon, so it could be hung as my faculty showcase piece. I had met my deadline. All that remained was to wash the quilt to remove the quilting markings. With confidence, relief and a tad of trepidation, I put my "baby" in the washing machine on cold, with a box of color catchers, just for good measure, and enough Synthrapol for 10 quilts. And prayed it wouldn’t bleed. Even though everything had been pre-washed, I know it’s still a possibility that red can bleed. I had a relaxing supper with my sister Barbara and friend Shari and did my final preparations for setting up my booth at Vermont Quilt Festival. After supper the washing machine was done and I took my quilt out to hang up to dry. As I took it out I inspected my quilt and uttered a loud, screaming, groan. My quilt was now a three-color quilt- red, white and pink. The white fabric of the inner border turned pink where the red, pre-washed fabric bled. There was a pink, shaddowy cast on the white fabric of many of the blocks. The quilt markings did not all come out with washing. Hope against hope, the red dye bled and the quilting markings had not come out! My quilt of three years in the making was ruined. I fought back tears and turned to anger. Barbara was devastated on my behalf but also began problem solving. Using toothbrushes and detergent the three of us spot scrubbed every single quilt marking and bleeding red pink spot. The meticulous scrubbing seemed to help the markings a little. Mind you, I used marking implements designed for marking fabric that all swear to wash out. However, we couldn’t tell about the pink spots. I tried not to panic. In hope, I washed it again in cold water with the remaining Synthrapol and another box of color catchers. Meanwhile Barbara drove up and back to Plattsburgh, NY, an hour away, to get more color catchers and anything else she could think of that might help in case we had to wash it again. The second wash removed a bit more of the markings, though not all, but didn't have any impact on the bleeding. While waiting for Barbara's return, I draped the quilt over a chair. Sitting there, stewing, I could see the red dye bleed even more into the white. "Stupid. ", I thought. "Of course the dye’s going to run downhill." I quickly laid towels down and put the quilt face down on the towels. If it was going to bleed more, the dye would run into the towels instead of the quilt. When we picked the quilt up, the red had indeed bled onto the towels. Barbara returned. We scrubbed some more and did another washing. It had no effect. Heart-broken, discouraged and angry, I was bereft of being able to save my quilt. Three years of loving work hand stitched and hand quilted into my quilt, and I was convinced it was ruined! If I had been alone, I would have just given up. I wanted to throw the quilt out. I was also embarrassed. What kind of a quilt “professional” am I to spend so much time on a quilt only to have it ruined. I should have known better, I thought. What I knew was that ruined or not, Red & White Explosion was promised to the staff at Vermont Quilt Festival for hanging the next day. So I lightly dried it and hung it up to air dry the rest of the way. I delivered my quilt to the Vermont Quilt Festival staff and told them of my quilt disaster, but they chose to hang it anyway. Once it was hung, it was hard to see the red bleeding. It mostly looked like a trick of lighting, a pink cast. It took me three days to go see it where it hung, because I was so angry and embarrassed. People who saw it loved it and didn’t seem to notice, but I knew. The truth was it was ruined. I would never be able to enter it into any competitions. I had given up, but God and my sister had not. Read Red & White Explosion: From the Agony of Defeat... for the rest of the story.